Terri knits: Hour glass sweater. I'm not sure if I'm pleased your better 'cos your better... or sorry your better 'cos you have to do the night shifts???? I think the jumper will be fine on a real person. Your recent FO's are great, as ever. I'm sure the HG sweater will look lovely on your sister. It's a lovely sweater, and will suit your sister very well I think. I am working the night shift on Monday and Tuesday nights next week, how about virtual tea and toast at 3:00 am? Glad to hear you are feeling better but boo hiss to nights. I love the jumper and am sure it will look great when on someone the right size. 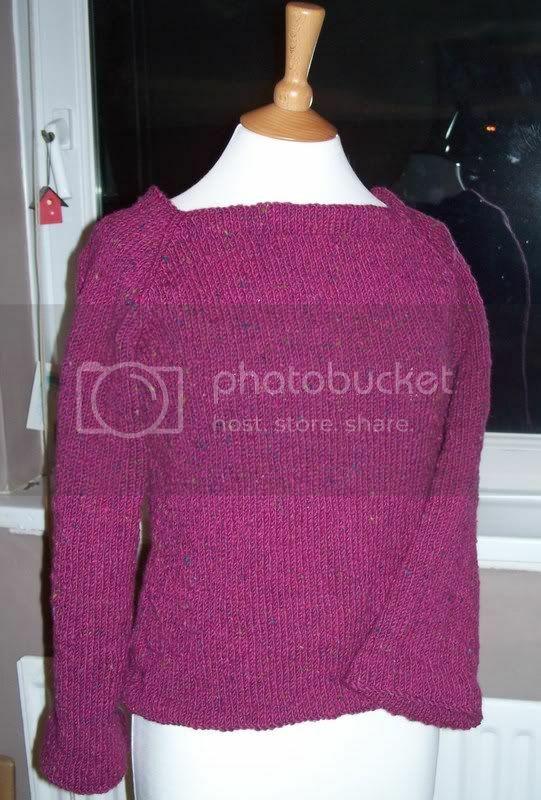 The jumper is such a lovely colour - I'm sure it will look great on the right size person as it's a great pattern. I hope the nights go fast. I used to hate nights as I felt so grotty all the time. Hourglass is nice. I hope it fits your sister OK.
Ooooh I didn't realise you'd been ill Terri - I'm glad that you're betterer now though. The Hourglass looks lovely - I wish I was you sister! - and your speedy needles must be smokin' ! Oh dear, I'm getting worried now, re: the sizing of the Hourglass, especially since we're using the same yarn. Bah. I'm not sure whether to knit on to the armholes, or to rip now and knit a smaller size. Decisions, decisions. It looks lovely, btw, a beautiful colour. I'm sure your sis will love it!